I have reached that point in pregnancy where I am starting to sew clothes that will work for breastfeeding when the baby arrives. 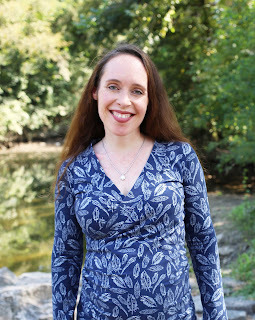 Today, I am reviewing a LAVitality top pattern that is advertised as a V-neck, but it is constructed as a wrap top; so, I know it will give great breastfeeding access. 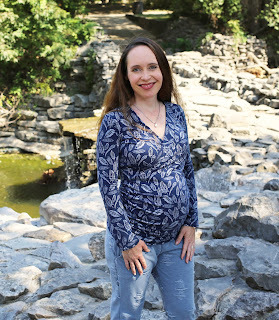 The LAVitality Wrap Top is a pattern I found on Etsy. Prior to purchasing this pattern, I was not familiar with LAVitality or their patterns. I was quite surprised at how very inexpensive they were (less than $3 at regular price!) and thought I would give the pattern a try! Fabric: Both shirts were made with cotton lycra from Made Whimsy. The navy knit can be found here, and the cream solid can be found here. Size Sewn and Pattern Adjustments - I was in between sizes on the size chart and ended up going with a Small. My bust is at 36 inches so I was a little over the range for small. The pattern comes in a shorter length and a long length. I chose the long length and added an inch to the bottom of both front pieces so I could have extra room in the belly. I am only 5'2" so I would not have done this if I was not going to wear it for maternity as well. Pattern review - I really liked how both shirts turned out. They will be very easy to nurse in and yet the neckline is modest enough that I do not need to wear a cami underneath. All the points in the pattern matched up very nicely. The neckband had notches and was very easy to put on. I love a pattern that I can get the band right without having to measure my own! The instructions and pattern photos were very clear and easy to follow. The pattern came together pretty quickly. The only warning I have about this pattern is the sleeve length. I normally need to take out several inches on sleeves due to my height, but these fit me perfectly. If you are average height or tall, you will need to compare the sleeve pattern to another long sleeve pattern that you already own and add length. These photos were taken in September when I was 24 weeks pregnant. I was trying to plan for cooler fall weather, but it ended up being a very hot day! As a maternity top, both shirts still fit me at 33 weeks pregnant, and the bottom band still falls under my bump. 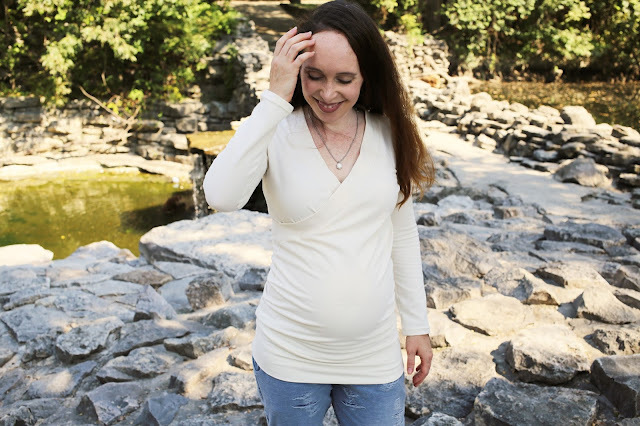 It is starting to get snug, though, so I may not wear it in the very last month of pregnancy because I do not like clothes to be too tight on my stomach when I feel huge. 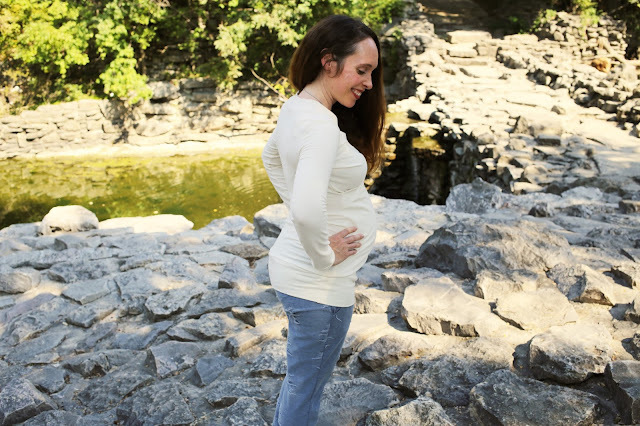 If you are making this pattern mainly for maternity, I would size up for the belly and choose a fabric with a lot of stretch (like rayon spandex). The pants I am wearing with my tops are my oh so comfortable Brassie joggers (blogged about here) made in distressed knit from Mily Mae Fabric. Thanks for reading my blog. You may follow me on Instagram or receive updates by liking my page on Facebook. Disclosures: This post does not contain affiliate links. Any and all opinions expressed are my own. Thank you Lucia! It’s a wonderful pattern, and I’m excited to try out more of your patterns in your Etsy shop! Sharon these tops look beautiful on you and I am tempted to make myself one for nursing!